Who doesn’t enjoy long walks on the beach? When I travel, my type of tourism consists of walking, taking photographs, lounging about, and eating fruit. I try to avoid paying for tourist attractions. I’d rather take advantage of all the free sights and stay outside as much as I can. Walking is my favourite way of experiencing a new place because it’s free and a slow activity, so I have time to appreciate (and photograph) everything I see. Also, I never need to worry about working out or going to the gym because easy exercise is built into my daily routine. 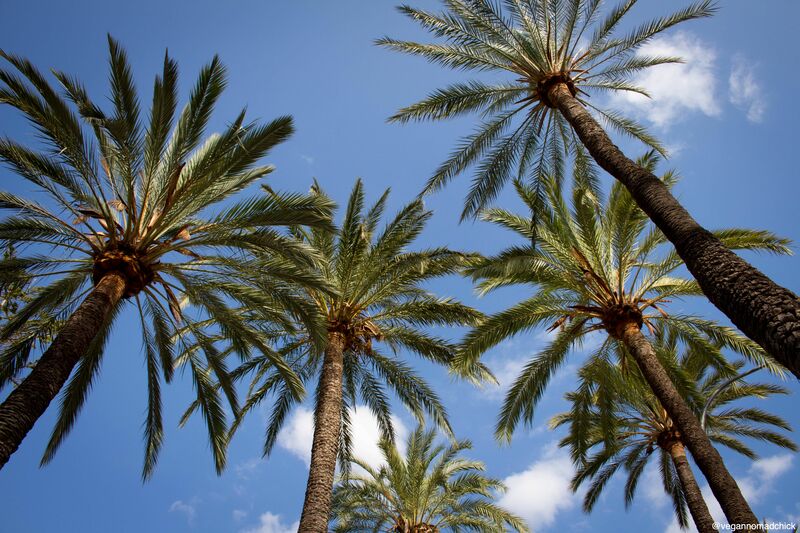 With Palma’s promenade lined with palm trees all along the beach, I find myself walking, admiring the sea, at least once every day. 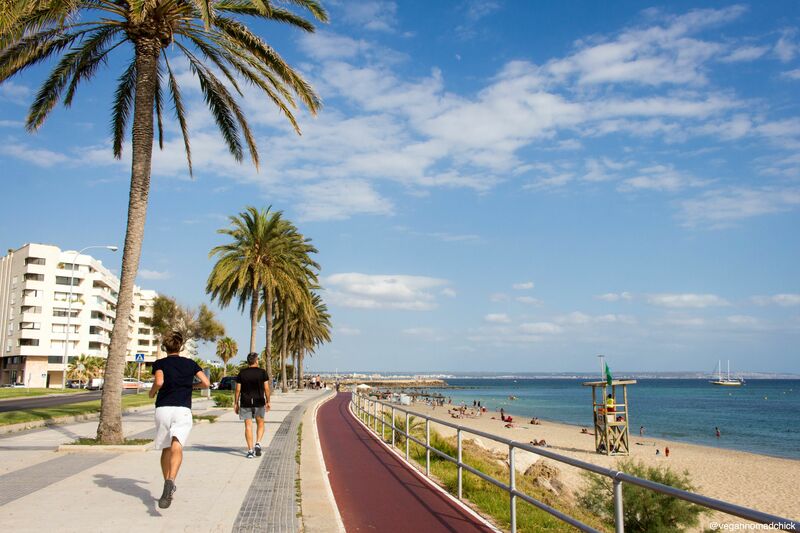 A dedicated bike path also runs along the promenade. If you prefer cycling, rent a bike for a day. I didn’t get around to renting a bike this time, but what can I say? I’m cheap and would rather walk with my camera in hand. Unfortunately, you won’t find much shade along the promenade and bike path. Because of this, I recommend going for a walk later in the day. Then you can take breaks, sit along the path as most parts are lined with concrete benches, and watch the sunset as you listen to the waves. That being said, visiting the sandy beaches during the day has its rewards. Just remember to wear sunscreen or bring a hat! I was taken aback by the incredibly deep blue and aquamarine colour of the sea the first time I laid eyes on it. Photos can’t capture the true colour; you need to see it for yourself! 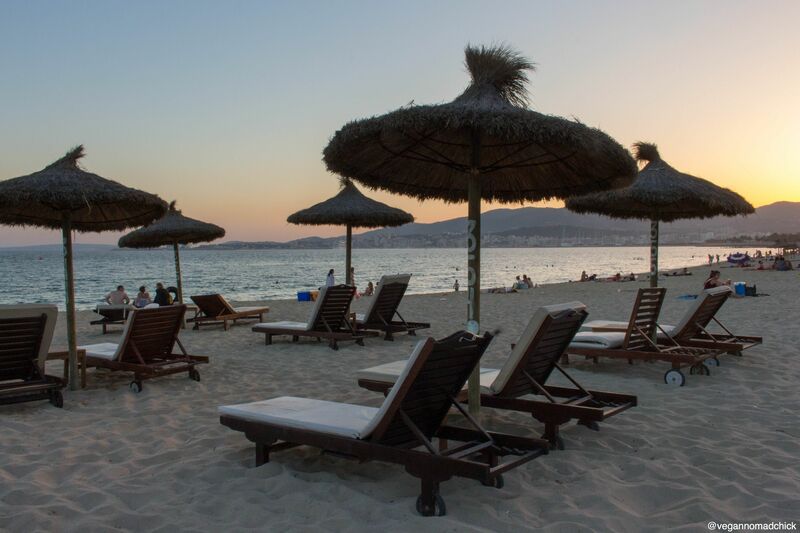 You’ll find a long stretch of sandy beaches just east of the Palma Cathedral and Parc de la Mar, stretching from Anima Beach down to Nassau Beach. (While these sound like the names of beaches, they actually refer to two small restaurants located right on the beach itself.) Search for the C’an Pere Antoni part of the city on Google Maps to easily locate this beach area. Later in the day, once the sun starts to set, look out for beach cats emerging from the rocks just to the right of Anima Beach. I’ve seen several lazing around! Most beaches have areas with lounge chairs and umbrellas, but keep in mind you need to pay a few euro to use them. I recommend walking down the pier just past Nassau Beach around sunset. 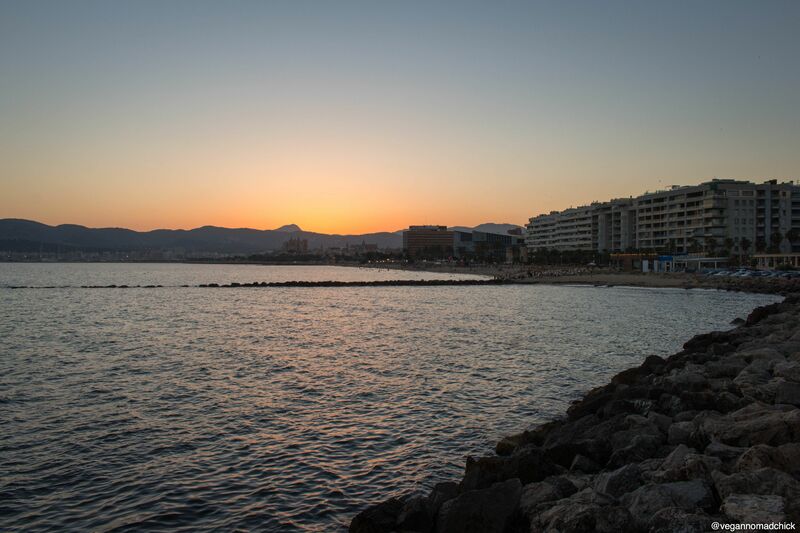 On one side of the pier you’ll see a small harbour and the Portixol suburb of Palma, and on the other side, you’ll have a perfect view of the sunset. 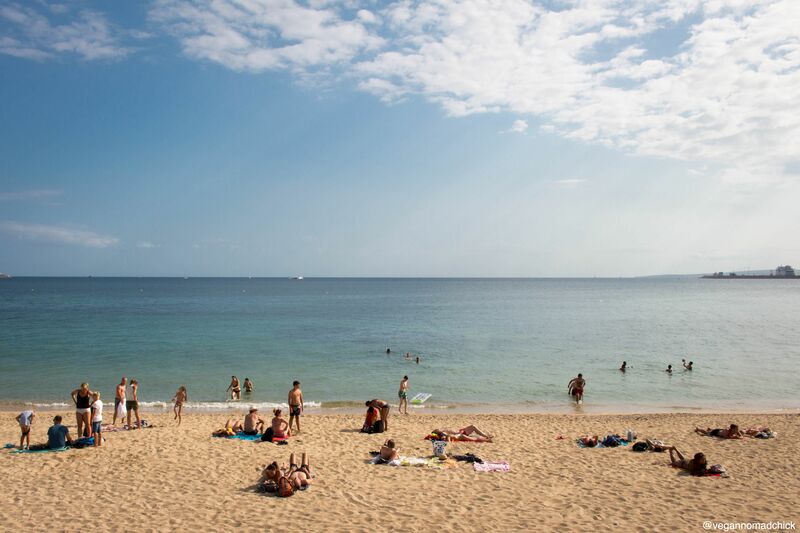 If you head further east, closer to the airport, you’ll find more beaches (no surprise!). One day I took a bus east to Can Pastilla, checked out the beaches there and walked back toward the city along the promenade. I passed by several sandy beaches as well as rocky areas and a park. The beaches near Can Pastilla (and Ciutat Jardí, closer to the city) were sandy, clean, and deep. You’ll find plenty of space to relax even in the middle of tourist season. Another day I decided to venture west of the city on foot. I walked along the promenade next to the sea until I reached the Porto Pi Centro Comercial, a massive multi-story shopping mall complex. I walked to this destination because I knew it would have bathrooms, indoor seating, and air conditioning. Sometimes I just need a break from the sun! A large supermarket, Carrefour, is located on the bottom level as well, perfect for refueling with some fruit for lunch! As long as you have the willpower to avoid shopping, taking a break inside a mall is nice on a hot sunny day. 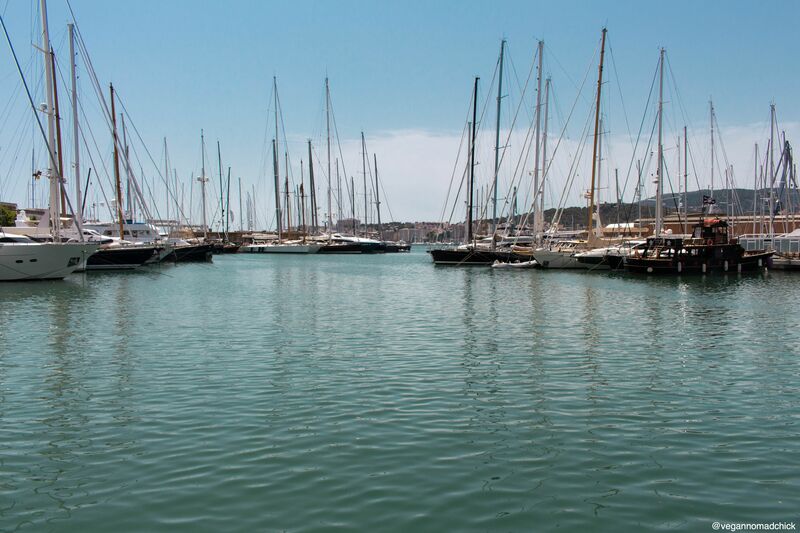 I didn’t find any beaches just west of the city, but I got plenty of sunshine and walked by several marinas. 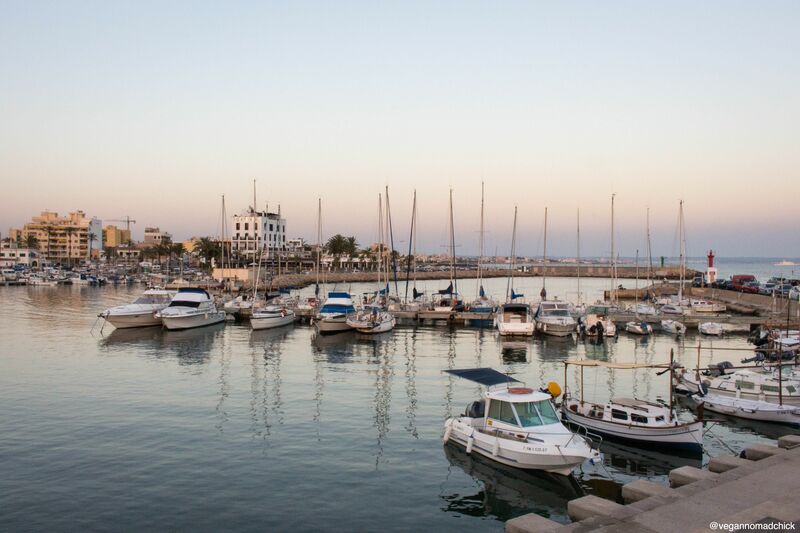 If you find yourself exploring the western part of Palma, I recommend taking a detour into the Santa Catalina neighborhood on your way. 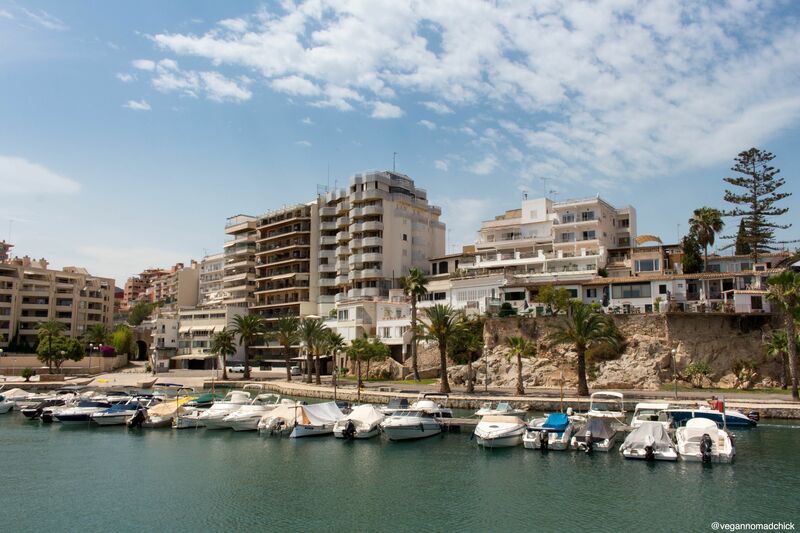 This part of town is quieter than the city centre because fewer tourists venture here. You’ll find several vegan and vegan-friendly shops in this neighborhood but not all of them are listed on Google. Have a wander around and explore! 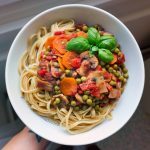 My favourite places to visit in Santa Catalina are Cream Crew, the only all-vegan ice cream shop in Palma, and the vegan supermarket Lovegano. Walking along the beach, sunbathing, and swimming are all free activities. 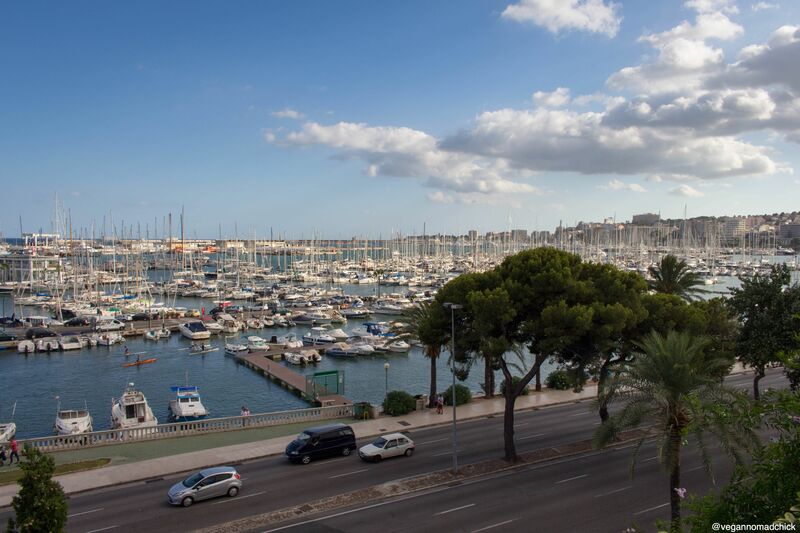 Why pay to be entertained when you can enjoy the beauty of Palma for free? How do you experience a new place? 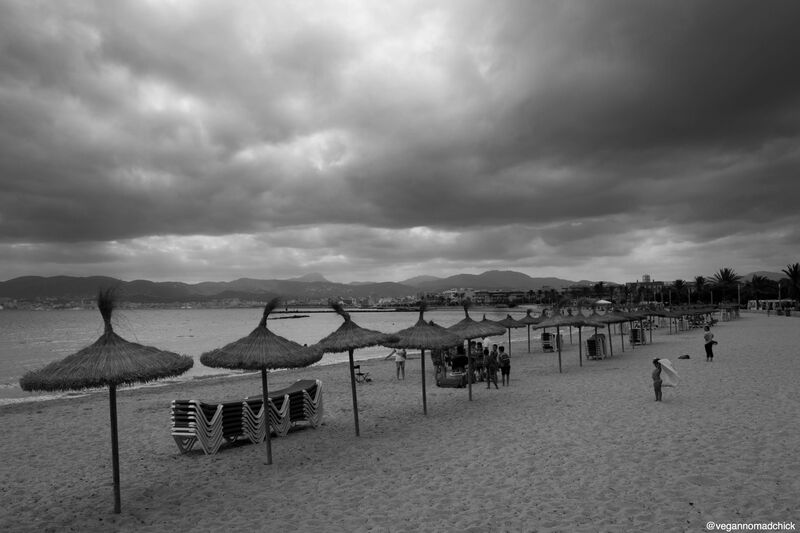 « Parc de la Mar & the Palma Cathedral.